I got the top done at retreat last month. When I got home I just had to put it up on the wall for a while. I did not have a back for it but my mom found some on sale in her travels. Now I have to wait for her to return home next week. We will see if I like it or not? I will have to quilt it over the Christmas holidays as I still have many customers quilting for Christmas to do. This pattern is from one of Kaffe Fassett's books. Simple shapes or something. I can not find the book at the moment. I saw one complete at Earthly Goods and I knew I just had to do the quilt. I called it my "Bad to the Bone" quilt because I had so many on the go, I was very bad to start another one. 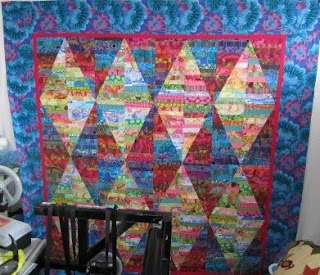 I guess at Earthly Goods they have a kit for sale to do this quilt but I am not a kit person. The best part is finding the fabric and pick out what I want to use. Today is Monday, So here is the link to Judy's Design Wall Monday. Thanks for stopping by. I love comments It is what keeps me going so please comment. I will check out your blog too if you have one and comment. Thanks. So cool! Great colors! Sometimes the magnetic pull of a quilt is just too hard to resist - LOL! Glad you did this one- thanks for the inspiration! It is great - hope you find time soon to quilt it. That looks lovely. I always enjoy seeing all the different fabrics you put in your quilts. I love, love, love this! I have started gathering fabric for one of these. I also led some ladies at church to make some of these blocks for a charity quilt (using my scraps) then I LOST the blocks...(our house flooded and was packed up by strangers but the blocks should not have been downstairs)....so next year I will find them and try again. Oh that was totally worth starting tho - very beautiful! !